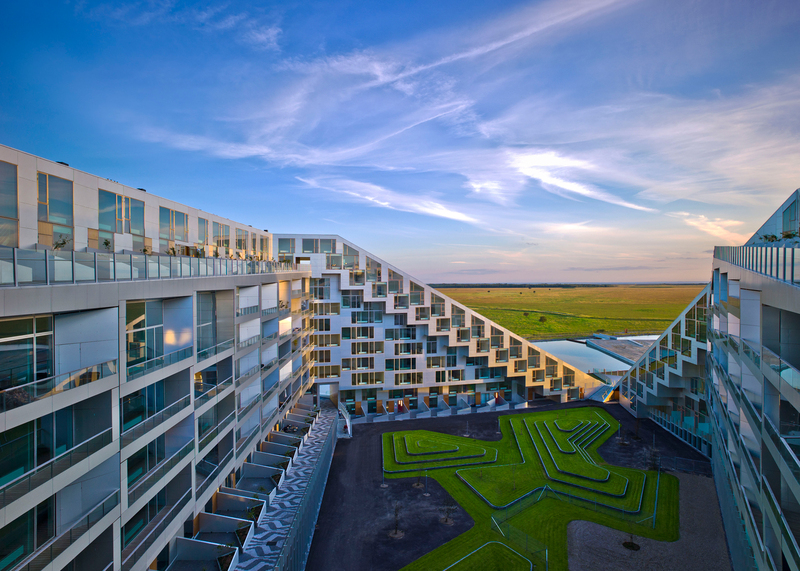 Danish architect Bjarke Ingels claims his Copenhagen housing development has accomplished the social mission Brutalist architects Alison and Peter Smithson set out to achieve with their "streets in sky" concept in the 1960s and 1970s. Named 8 House because of its angular figure-of-eight plan, BIG's building dips and rises at the corners to create a dramatically sloping roof form. The complex contains a mixture of housing, shops, offices and a kindergarten all connected by sloping walkways that stretch down to a central courtyard. These elevated walkways or "streets in the sky" follow the Smithsons' post-war model for flats connected by public pathways, which they believed would encourage social interaction between residents. "The Smithsons tried to realise this and I think they never really succeeded," said Bjarke Ingels, during a talk at the Royal Institute of British Architects earlier this week. "I think maybe because the connection to the ground was actually sort of covered over." "I think here that a seamless continuation of the public realm has made it incredibly lively," he added. The Smithsons attempted to put their concept into practice at the Robin Hood Gardens estate in London, with mixed results. Critics have since blamed the Smithsons' design for antisocial behaviour on the estate, and the local council now intends to replace the structures with new housing. Ingels believes that providing more direct access to the ground level with sloping – rather than parallel – walkways has made 8 House more successful. A courtyard at the centre of the 8 House scheme features a series of grassy knolls not dissimilar to those at the centre of Robin Hood Gardens. "Not only do we optimise the conditions for the individual programmes but we also elevate the social space," said Ingels. "You end up getting almost small-scale community life happening inside a big building." But Ingels said he was sceptical that this type of project could work outside "semi-socialist" Copenhagen, particularly when he was commissioned to design a similar "courtscraper" scheme for Manhattan. "Housing is a major aspect for creating the framework for our lives and I often get this objection that the kinds of projects we're doing only work in semi-socialist Scandinavia," he said. The "streets in the sky" idea was first proposed by French Modernist architecture Le Corbusier, and a number of the Smithsons' contemporaries also tried to create housing using similar concepts. These schemes are now among some of the most ill-fated social housing projects in Britain. An unsuccessful preservation campaign to save Robin Hood Gardens from demolition was backed by a number of high-profile architects including Zaha Hadid, Robert Venturi, Richard Rogers and Toyo Ito. Prime minister David Cameron recently pledged to overhaul or demolish 100 of the UK's "brutal" housing estates from the post-war period, describing their design as a "gift to criminals and drug dealers". His comments prompted warnings that the UK was at risk of inflicting an architectural "tragedy" on itself. Bjarke Ingels spoke during a series of lectures to mark Zaha Hadid being awarded the 2016 Royal Gold Medal this week. She is the first female architect in 167 years to win the prize without a male counterpart.